In heart-wrenching situations, one phrase can give the grieving a little divine comfort: "I'll be praying for you." At some point, everyone enters seasons of difficulty. Often, it can be difficult to know what to say or how to comfort struggling friends and family without sounding trite. 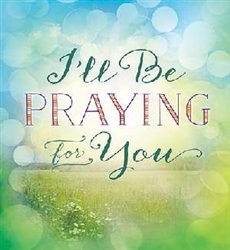 Filled with scripture and inspirational quotes, "I'll Be Praying For You" is the perfect gift for a loved one who might be experiencing disappointment, sorrow, or grief. Featuring beautiful photography, landscapes, and stylized text, these comforting images and words will help soothe hurts of struggling loved ones. The general inspirational content is appropriate for a variety of situations such as depression, workplace struggles, divorce, and the loss of a loved one. This mixture of beautiful, peaceful photography overlaid with stylized text of inspirational quotes and Scripture is very popular on Pinterest boards and in modern home dacor, which will capture the attention of women of all ages looking for a comforting and beautiful gift.